That's why I've been spending time sewing with it, right? 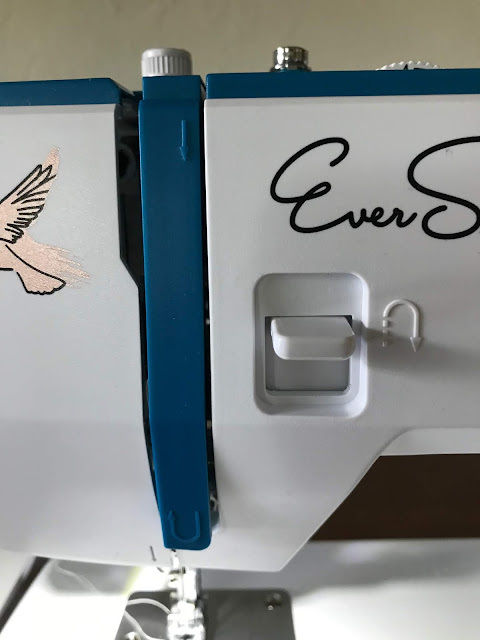 This is my brand new EverSewn Sparrow 15, the bottom of the Sparrow line and the only mechanical machine in the line. 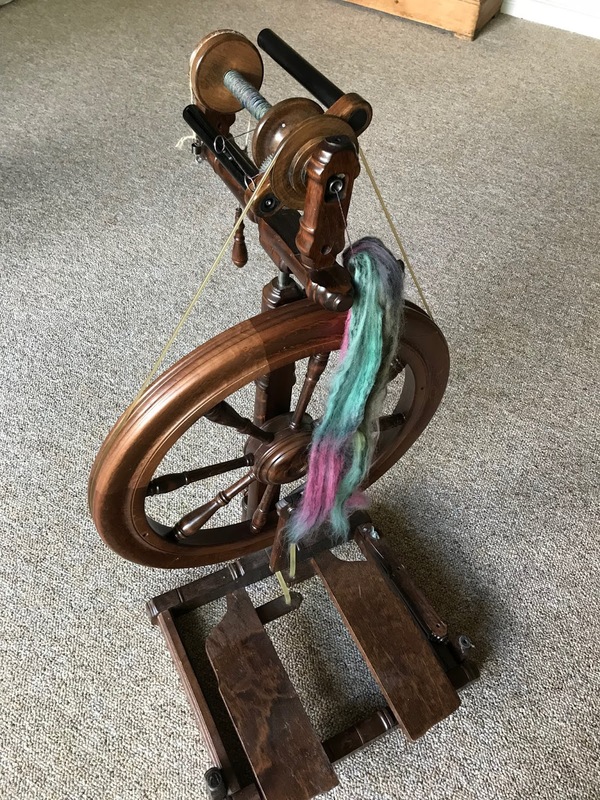 As of last week's blog post, I had wound bobbins. Easy enough, although I did find I had to guide the thread to keep it so it wouldn't pile up in one place. No problem; where would I go? I need to sit there with my foot on the pedal. Placing the bobbin case into the machine was also easy. 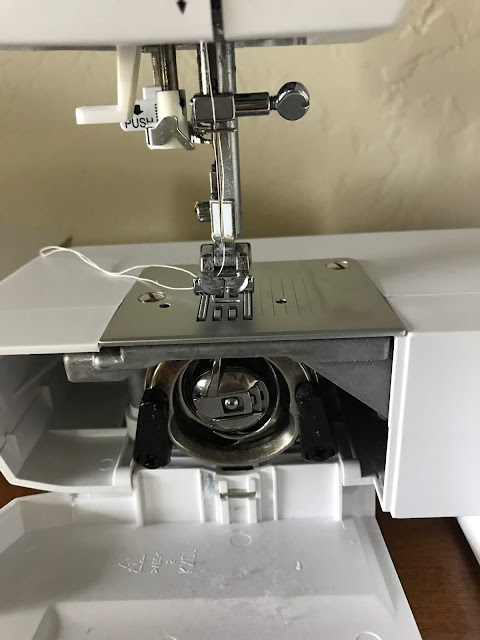 I like that the bobbin case fits into the machine vertically, rather than horizontally, so I don't have to dig it out or use a special bobbin remover. I found threading very easy, once I had done it a couple of times. 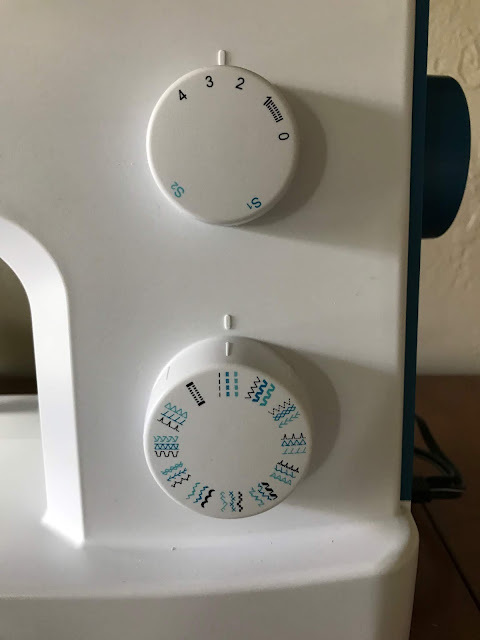 You just loop the thread down the right side of the blue bar, back up the left side of it, around a substantial hook you can't miss at the top and back down the way you came, stopping at the needle, where you have one more hook right at the needle. It takes maybe 30 seconds, tops. 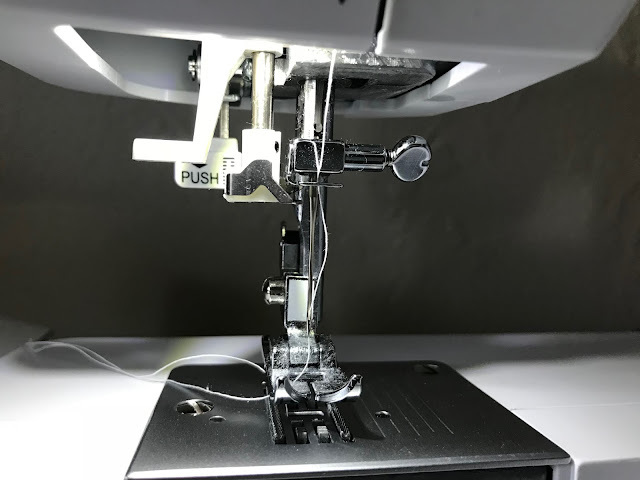 I learned how to use the automatic needle threader. It's a little fiddly at first, and you do have to remember to pull on the loop, not the end of the thread. I also found it helped to keep my thumb in front of it to keep the thread from popping out. 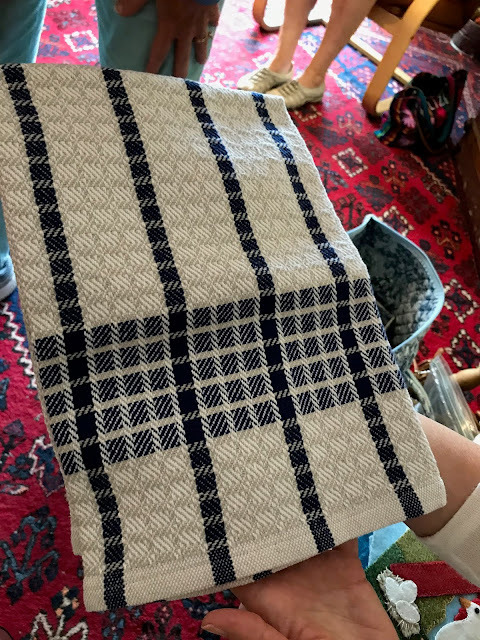 I had sewn on several different thicknesses of woven fabric. I learned how to adjust the pressure of the presser foot for very thin fabric, which worked perfectly. It's the little knob right at the top of the blue bar. You just turn to adjust the presser foot pressure. I like the reverse lever, which goes back into place when you let go, so you can go forward again quickly. You can see the lever in the photo above where I was talking about threading the machine. It's right below the "Ever" in EverSewn. I used various widths of zigzag to finish edges and seams, but only the simple zigzag so far. Fine so far, but then I ran into trouble. I noticed that occasionally the bobbin thread would get loopy and loose. Then it would be fine again. This concerned me. I poured over the manual and found several potential causes. The needle seemed stiff going down through the throat plate, and I started to worry that I had damaged something. However, it seemed to sew fine most of the time. The next thing that went wrong was when I decided to change to a ball-pointed needle to use on stretch fabric. The thumb screw on the needle clamp could not be budged by this puny old person. I lowered the needle a bit so I would have more room, grabbed a piece of rubber shelf liner I use for opening jars and had another go. Nothing. It was as if it had been Superglued into place. Finally I got some pliers and, still with the rubber shelf liner (now to protect the finish on the thumb screw) I had another go. I got it half a turn, tried with my finger and thumb again, but it was still too stiff. I ended up having to make one full revolution before I could use my fingers. Then the whole needle clamp assembly fell out. I put it back in place, inserted my needle, but then the automatic needle threader wouldn't work. I threaded by hand, and sewed a little bit with no problem. 1. The stiffness of turning the wheel to make the needle go down through the throat plate is normal. 2. The problem loosening the screw to change the needle is a factory issue. She promised to report it. She didn't know whether that screw was tightened by machine or by a person, but it was certainly too tight. It doesn't need to be that tight to work. 3. Even though it sewed fine, I didn't have the needle all the way in, so the needle threader wouldn't work. Once I reinstalled the needle, the threader worked. 4. The loopy bobbin thread was due to pulling on the fabric. You don't need to do that. You have to just relax and only guide your project. On stretchy fabric, even, if you're using zigzag, you don't need to pull. Just let the zigzag do the work. No more problems for now, and I feel assured that I can get help if I have problems in the future. I told EverSewn's nice lady Karen I would love to have an online class in how to use all the features, like a Craftsy class. I was even willing to pay for it. She said they were "in talks," so maybe there will be one soon. I'm a happy camper, but one more negative, and it's a small one. The "dust cover" has a hole in it for the handle, so at my place, anyway, dust can still get in. I plan to make a real dust cover from these measurements and just keep this one to protect the machine if I take it to a class sometime. 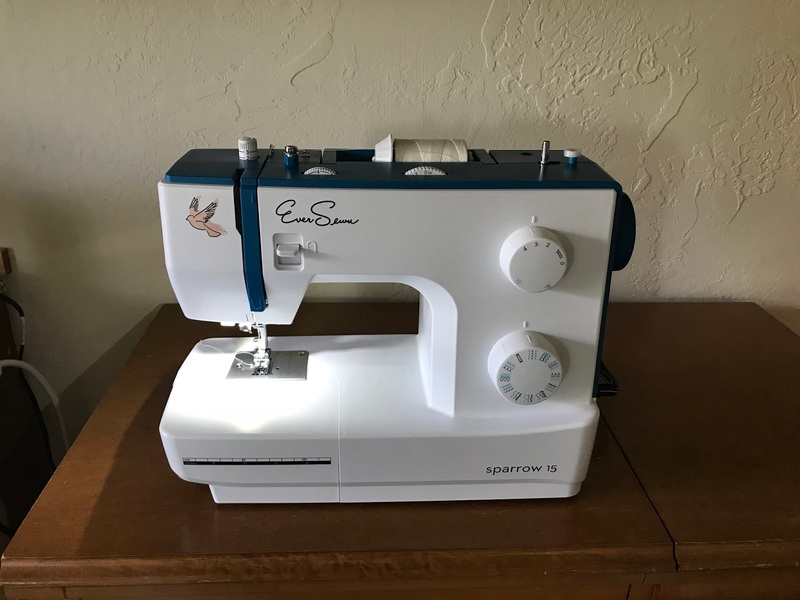 So what have I made using my new Sparrow 15? First the simple straight sewing and just using the zigzag for finishing the raw edges. Some pajama pants for Mandy. This is a simple, one-pattern-piece design with a faux drawstring. I wrote up the pattern and a tutorial to make it really easy here. 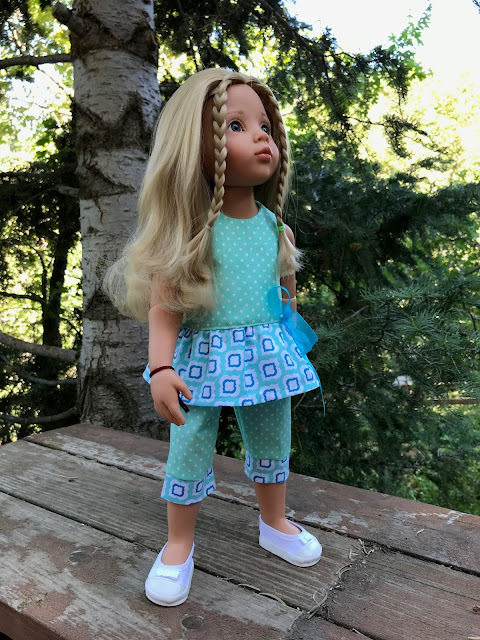 Then I made a play outfit for Jolena, based on Simplicity 1484, but with a lot of modifications. I altered the neck, shoulders and armholes. I cut the skirt on the bias, because then it doesn't fray when you gather it and I like the drape better. The pants are similar to the tights in the same pattern, but made wider by 1/2", because I was using woven fabric, not stretchy, and 1" shorter, so I could add a folded band of contrast around the bottom, also cut on the bias, so the fitting would be easier. Then I used a very thick fabric. I think this is duck. It's a very dark navy. 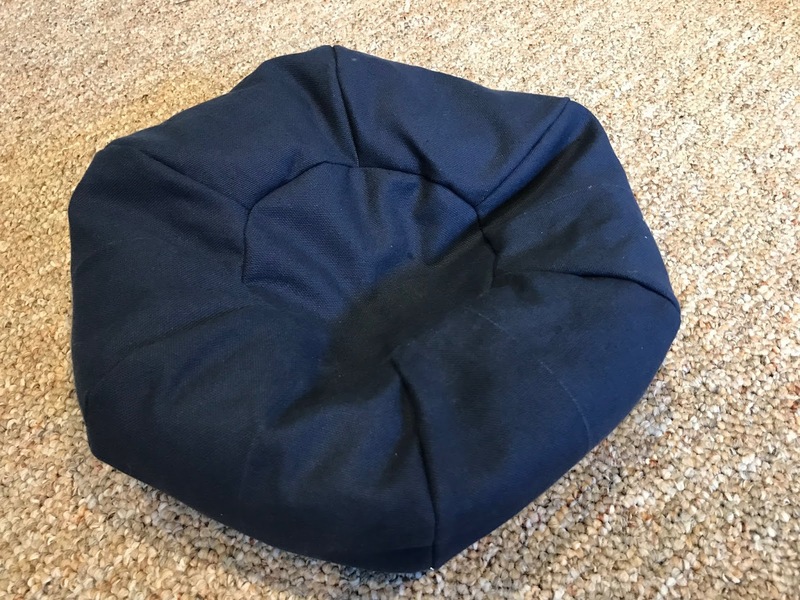 I made a beanbag chair for the girls. I found this pattern and enlarged a screen shot of the pattern piece so it filled an 8 1/2 X 11" piece of paper. (It was designed for a toddler, so you would have to enlarge the pattern piece much more.) For the round piece, I picked out a plate to use for a pattern, once I had the six wedges sewn together and could see how big my circle needed to be. 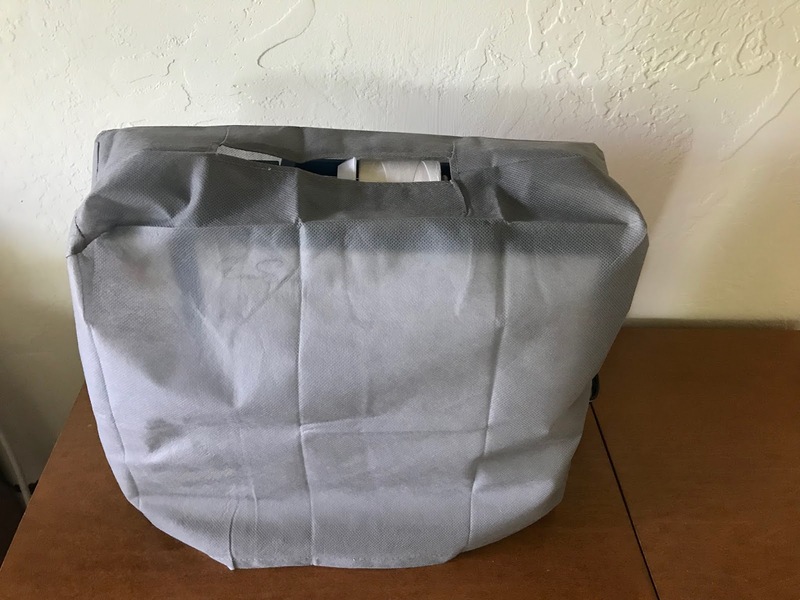 I stuffed the bean bag with plastic bags. Vroni thinks it still isn't full enough. The bags will come out. After we get moved, I'll probably fill it with a bag of rice and sew it shut. Unless I can find some polybeads that are cheaper. Then I jumped into using stretchy fabric to make a couple more swimsuits for the girls using socks. The hats are Matilda's Closet's Bucket Hat pattern from Pixie Faire, but I didn't use interfacing, and instead of leaving an opening on the edge of the brim, I left one in the lining, where the brim and band meet, about 2". That helped me get the brim nice and smooth. I closed the opening when I topstitched around the bottom of the band. I wrote up a full tutorial with the new bathing suit design here. It's funny how I had no trouble with the stitching once I stopped pulling on it. This was pretty easy. Stanzi came out of hibernation. I set her up in the almost-empty loom area of my fiber studio as-was and loaded her with some Merino/Tencel roving from AlohaBlu. The colorway is "Frog Prince." Common Threads met at my house, since I finally got it clean. We had a nice time together and some pretty projects to see. 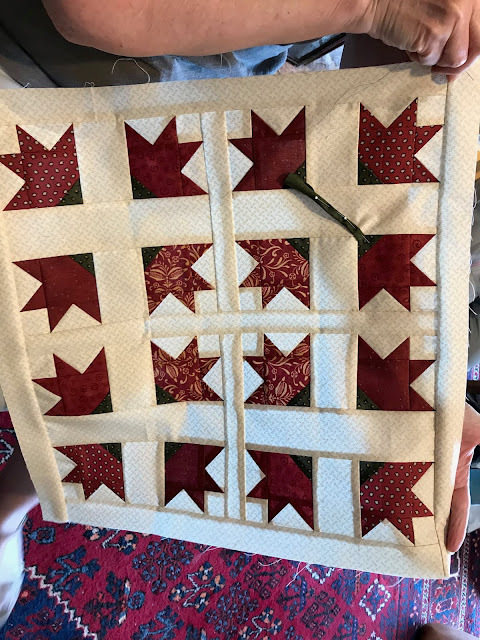 Karan was working on this Idaho Lilly quilt. Susan, one of our part-time residents, came with some knitting and this woven dish towel to show. Margareth was working on an appliquéd wall hanging. I snapped this photo before I knew it would be displayed vertically. 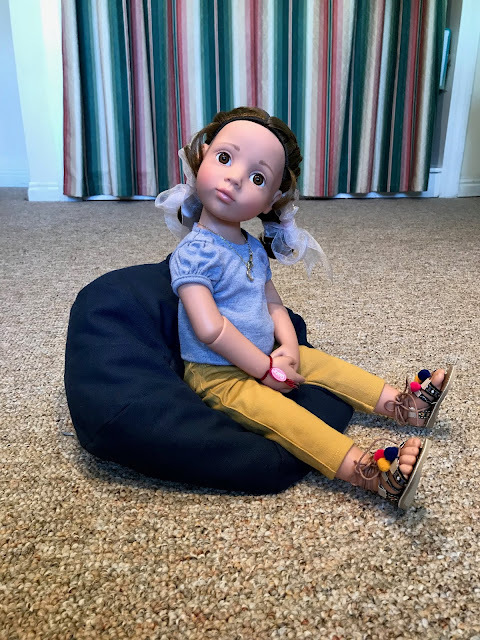 The Doll's Storybook blog for children came out as scheduled on Friday. 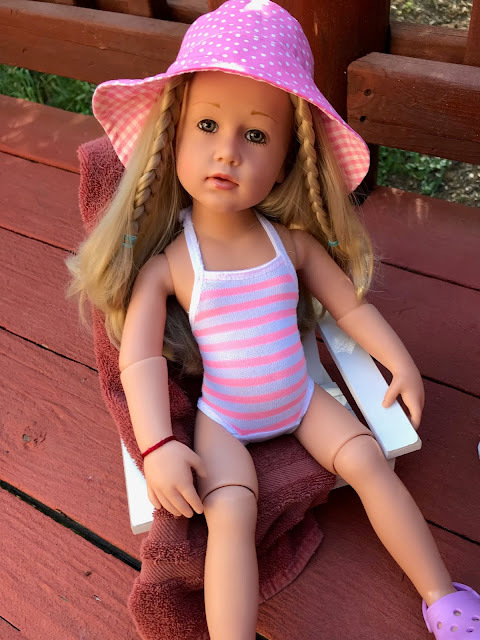 In this one is called What Do Dolls Do on Their Day Off? I hope it isn't too scary; it has a bear in it. So the honeymoon is over, but it looks like the marriage will last. What's on my needles: Still the Kisu Cardigan for Jolena. Just starting the Kitty motif. Also the Coastal Skies shawl for me, no progress. 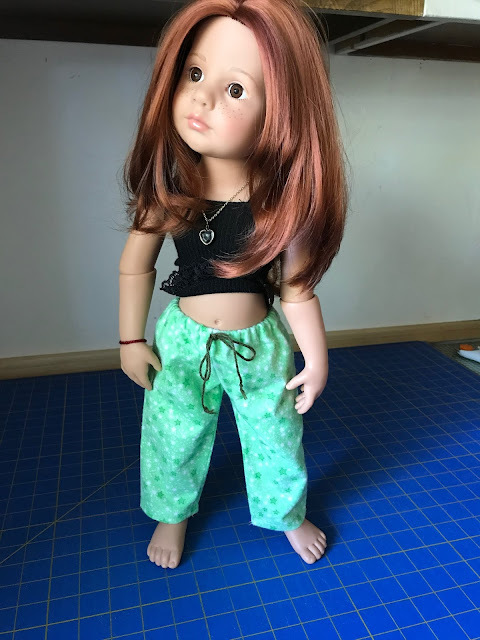 What's on my Sparrow 15: More doll clothes. Working up to things like sewing on buttons and making buttonholes. What's in my hoop: Still the Spring Flowers quilt, no progress at all this week. What's on my wheel: Stanzi is finally set up and at work. What's on my iPad/iPhone: Still listening to The Secret Book & Scone Society by Ellery Adams. No progress this week. What's in my wine glass: Lindeman's Cawarra Shiraz-Cabernet 2017. What's my tip of the week: A fleece bag filled with rice makes a great microwaveable heating pad. I have a couple. I make them longer than they are wide, not over full, so it will wrap around whatever part of your anatomy you want to use it for. I find I can often avoid using aspirin for joint pain. Midwinter it's nice in bed while I brush my teeth, so I can climb into a warm bed. It is sounding like the new machine is going to work out well for you. I love the idea of a lightweight portable machine. Hope you home sells quickly - one less stress is always a good thing. Have fun with your new toy. I hope the house sells quickly. Thanks, Pam! I'll keep updating as I learn more. Wish I had more time to sew. It's nuts here right now. We had two showings yesterday and had to be away from the house. We could go to a movie, but we have to take the dogs with us. Thanks for the review...sounds like a great machine. Love all the projects as always! Absolutely! I had low expectations when I placed the call, and I was very impressed. I’m definitely keeping it! Even if the buttonhole doesn’t work for me (one of the things I haven’t tried) it’s worth it for the zigzag function, now that I know what not to do. I didn’t need a needle threader, but I’m glad the machine has one. I may even use some of the decorative stitches on some doll dresses, although I never planned to use the machine for that. It’s very portable for taking to classes. It's nice to know you received such good customer service for this machine. It goes a long way in promoting recommendations for future sales. Thanks for the review of the Eversew machine. 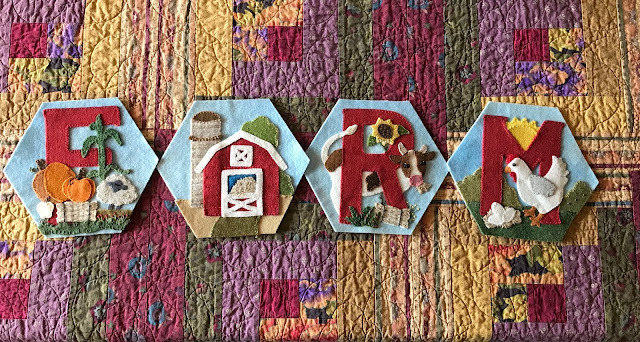 My friend Lynn & I took a road trip last Friday to a neighboring to visit the quilt store there & when I walked in I discovered they now sell this brand. I am seriously thinking of getting one to take to my Quilts of Valor meetings so I don't have to lug my heavy Pfaff to them. 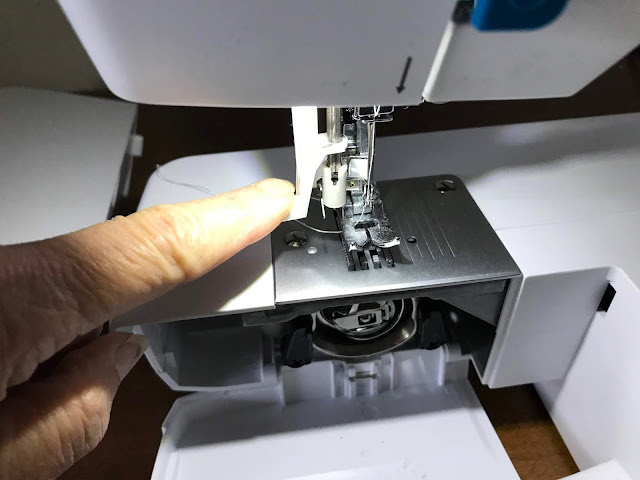 I think one of the hardest habits to break is not tugging on the fabric while sewing as that was so common with machines years ago.